1. Left-click (PC) or Control-click on the image you want to use and save it. You might want to rename it something that is meaningful to you so you can find it. 2. 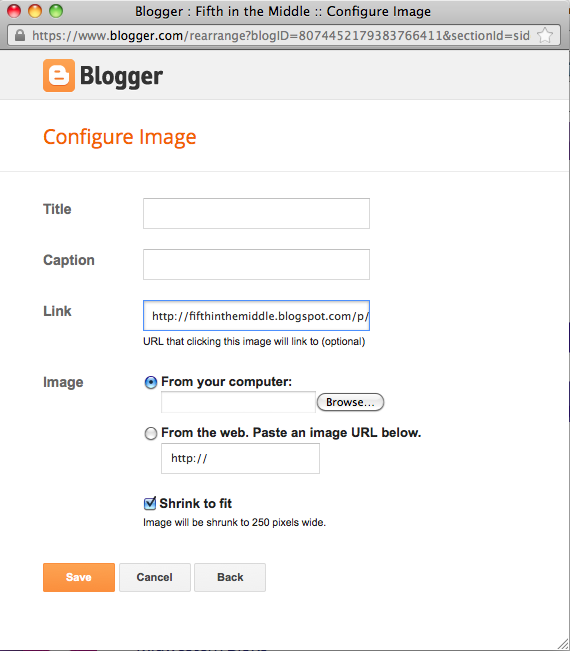 In Blogger, go to your Overview page and choose Layout. 3. Click Add a Gadget on your sidebar. 4. Click on the plus sign for Image. 6. Make sure that the button in front of From Your Computer is chosen and click Browse. Find the image of the button that you saved in step 1. Click Save. 7. 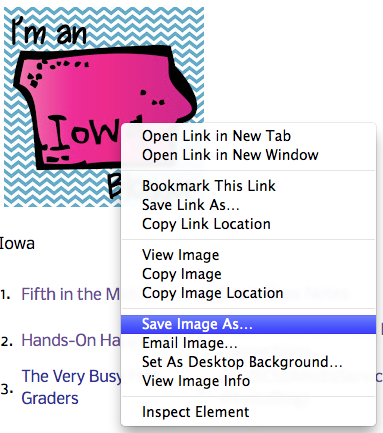 Once you've returned to the Layout window, click Save Arrangement. You're done! I have tried to add the state image with link to my side panel a few times now... but blogger never allows it to work!!! :( still being fussy! But I will search around and post back if I find a solution! Thanks! I <3 this idea! Bummer! I wish I knew what the exact problem was so I could help! Are there are error messages or anything? Thank you for doing this. It's great to see what fabulous bloggers are nearby. Wow! That was ease-peasy! Thank you for the visual tutorial! Do you know if you can do this with a WordPress blog? I think that you would do it the same way that you add anything else to your sidebar. I'm not familiar with WordPress, so I'm not sure. Sorry! Love this idea! Adding a button shortly! This is SUCH an awesome idea! LOVE IT!!! Love having a handy list of Michigan bloggers! Also love the button and the link up instructions. Thanks so much for this resource! Such a great idea, thank you so much! I love it!! Awesome, I just added my IL button! Thank you for such a cute resource! Thanks. Wonder why it forced me to have a title. I wasn't planning to since that would take a long time. Unless you know a shortcut to do 50 quickly. Mine tells me I have to add a title to the image. Any tips on how not to have to have a title on an image? What code? I thought maybe you meant the button code, but the whole code just showed up as the title. Try that code, but without the spaces except where I typed space. Question!!? If I live in NJ but teach in NY, what "blog button" should I grab? Or should I grab both?! I love your brainchild but I am currently teaching overseas. I created my own version of your state button for my current country (the UAE). Would you be okay if I use, blog, and share my country version to bloggers here? I would give you credit for the original idea.